Comité Directeur (CD) is the administrative and representative body of Aegee which consists of 6 people with at least 4 of them from different countries, working from the head office located in Brussels. Each member of CD has it’s own area of responsibility. The CD is composed of a President, a General Secretary, a Financial Director and 3 additional members with specific roles: Director for European Institutions, for External Affairs, for Public Relations, for Human resources, and Development of the Network and the Projects. The CD is the administrative ad representing body of AEGEE. The members are elected at the Agora and they live all together at the head office in Brussels (also called CD House). Commissions are the supportive and controlling bodies of CD. There are Audit Commission, Members Commission, Juridical Commission and Network Commission. The members of the commissions are elected by the Agora. Audit Commission checks the accountings and approves the “financial reports” of the various bodies of AEGEE (AEGEE-Europe, Local Antennae, Working Groups) and submit a report on its actions at every Agora. The 3 responsible members should come from 3 different antennas and also they can’t be part of the CD, so as to ensure the independency of the Commission. Juridical Commission consists of 2 people from different sections of Aegee plus one person choosen by the CD. They have legal knowledge and during the Agora they take care about the elections (voting procedure, counting of votes). They are responsible for the CIA (Corpus Iuridicum Aegeense) which contains the principles, statutes and regulations of the various organs of AEGEE and they assist the CD and the local antennas for possible legal problems. Members Commission may be called in case of serious problems within the Network, to investigate and find an appropriate solution. It consists of 4 members and the President of the Juridical Commission (plus a CD Observer that doesn’t have voting rights). Network Commission is composed of 11 members. They elect among themselves a person who is the Speaker of the Commission. Networks Commissioners support and motivate local offices in all areas, stimulating the organization of European events and trying to create new antennas. The Netcommies are also intermediaries between the local branches and the CD: since the CD can not deal with every single seat, Netcommies take care of the contacts between the parties. AEGEE Bergamo is part of the Rainbow Region, which includes Italy and Malta. Liaison Officers (LO) represents Aegee Europe at an institution or organization (eg. UNESCO or European Youth Foundation). CD decides to which institutions the LO should address and the decisions must be approved by the Agora. 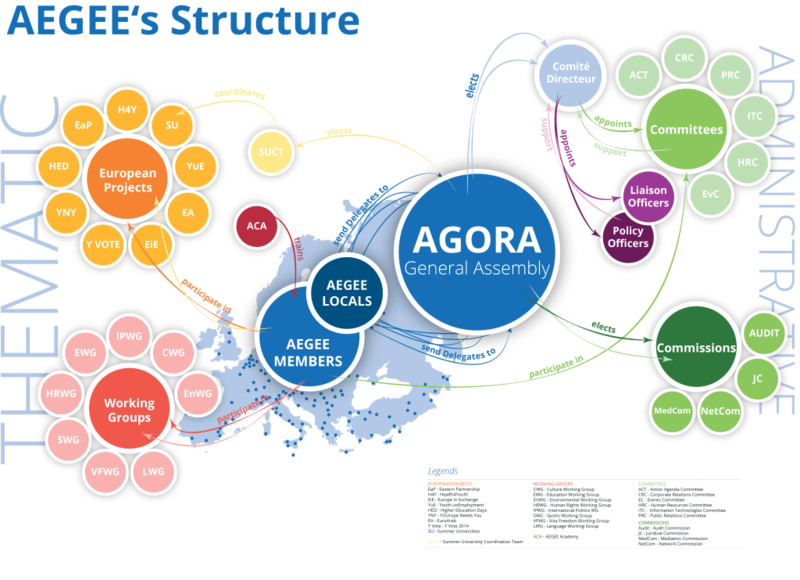 Agora is the general assembly of AEGEE, meets twice a year, usually in May and November. We gather up to 1,000 people, delegates from each section, to discuss proposals and projects, make decisions and set guidelines for the future. 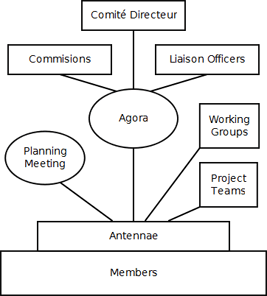 Planning Meeting (EPM – European Planning Meeting) is the members of local management’s meeting, or of their representatives. It lasts three days and meets once a year (February-March) to do strategic and thematic planning; the proposals will then be voted on Agora. Project Teams coordinate the work of AEGEE projects throughout Europe. These projects may be conferences on specific topics, theme days and every other type of activity. 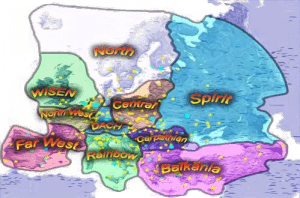 The teams are made up of members of different nationalities elected during the Agora. Antenna is the name given to a local group of AEGEE. Its activities are managed and coordinated by a board of 6-7 members and each antenna is organizing a European event at least every two years and various local activities. Often are supported by a university structure, given the fact that most of AEGEE members are university students.